Image credit & copyright: Jaspal Chadha. Would you like some color with your universe? 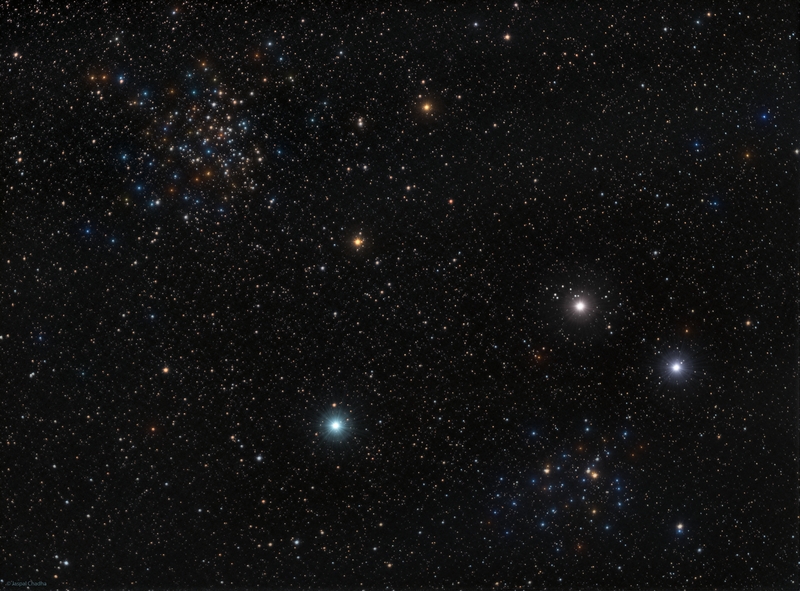 Then you’ll love this image of two open star clusters by Jaspal Chadha. 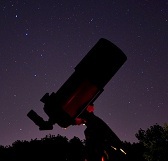 Of all the objects that you can observe from your back yard with a telescope or even binoculars, stars offer the most reliable opportunities to see color in your observations. Sure, color shows up in long exposure nebula imaging but when you observe them with your eyes in real time, they don’t offer enough light to deliver color perhaps with the exception of M42 Orion Nebula and a couple others. So here we have two open star clusters; NGC 1528 positioned at upper left and NGC 1545 at bottom right of this image. Both reside in the constellation of Perseus and although they appear side by side in this image it’s not quite the case. NGC 1528 is a beautiful object about 1,530 light years away and is comprised of about 165 stars that span a distance of about 13 light years. NGC 1545 at a distance of 2,300 light years is much further away and with a population of around 50 stars it’s also quite a bit smaller as well. Both of these clusters offer an apparent magnitude of about 6.5 which probably isn’t going to make them available to your unaided eye but with a little knowledge of the night sky, grab a set of binoculars or a small telescope and they should show up pretty easily. There’s also noted to be a carbon star (HIP19931) 736 light years away in this image and they just happen to be one of my favorite types of stars to view and image because of their beautiful orange-red colors. If you have a go-to telescope you can just punch in the SAO or the RA/Dec for this star and it will take you to it. Since we don’t have that luxury in an image we’re just looking at lets practice a little star hopping before it becomes a lost art. So through experience, I know where this star is and many of you may already know as well. But how do I help someone who doesn’t know anything about it find it? First step is to identify what the object is and we already did that. It’s a red carbon star in the constellation Perseus somewhere between the two open star clusters of NGC 1528 and NGC 1545. Now we need to identify a road map to navigate and basically what that consists of is finding small noticeable patterns in the stars. This time we’re going to use some bright, relatively nearby stars to guide us. In this image there are 5 stars that stand out. 3 of them are in a fairly straight, almost up and down line and they are two orange colored stars with a blue-white star at the bottom. To the right of them and just above NGC 1545 on the bottom right are two more fairly bright white stars. Draw a line from them as if you were going to split the two orange stars we already identified and just before you get between the two orange stars you will run right into little red carbon star HIP19931. All you have to do is find it once, you will then always be able to just look and see it. Image | This entry was posted in Astronomy (Learning), Astrophotography (DSOs), Images, Star Clusters (Globular-Open), Stars (Non-Sun Related) and tagged Astronomy, Astrophotography, Carbon Star, DanSpace77, HIP19931, Jaspal Chadha, NGC 1528, NGC 1545, NGC1528, NGC1545, Space. Bookmark the permalink.